See tables and graphs at the end of this article. The contribution from durable goods jumped 20.4% in Q3 from "Cash for Clunkers" then it dropped back to 0.2% in Q4. Contribution to GDP from "Structures" continues to plunge at double digit rates. 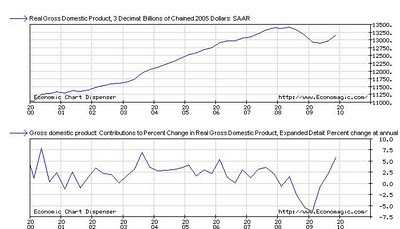 Real gross domestic product -- the output of goods and services produced by labor and property located in the United States -- increased at an annual rate of 5.9 percent in the fourth quarter of 2009 (that is, from the third quarter to the fourth quarter) according to the "second" estimate released by the Bureau of Economic Analysis. In the third quarter, real GDP increased 2.2 percent. The GDP estimates released today are based on more complete source data than were available for the "advance" estimate issued last month. In the advance estimate, the increase in real GDP was 5.7 percent (see "Revisions" on page 3). The increase in real GDP in the fourth quarter primarily reflected positive contributions from private inventory investment, exports, personal consumption expenditures (PCE), and nonresidential fixed investment. Imports, which are a subtraction in the calculation of GDP, increased. The acceleration in real GDP in the fourth quarter primarily reflected an acceleration in private inventory investment, an upturn in nonresidential fixed investment, a deceleration in imports, and an acceleration in exports that were partly offset by decelerations in PCE and in federal government spending. Motor vehicle output added 0.44 percentage point to the fourth-quarter change in real GDP after adding 1.45 percentage points to the third-quarter change. Final sales of computers subtracted 0.01 percentage point from the fourth-quarter change in real GDP after subtracting 0.08 percentage point from the third-quarter change. Real gross domestic purchases -- purchases by U.S. residents of goods and services wherever produced -- increased 5.5 percent in the fourth quarter, compared with an increase of 3.0 percent in the third. Real GDP decreased 2.4 percent in 2009 (that is, from the 2008 annual level to the 2009 annual level), in contrast to an increase of 0.4 percent in 2008. The decrease in real GDP in 2009 primarily reflected negative contributions from nonresidential fixed investment, exports, private inventory investment, residential fixed investment, and personal consumption expenditures (PCE), that were partly offset by a positive contribution from federal government spending. Imports, which are a subtraction in the calculation of GDP, decreased. The downturn in real GDP primarily reflected downturns in nonresidential fixed investment and in exports and a larger decrease in private inventory investment that were partly offset by a larger decrease in imports and a smaller decrease in residential fixed investment. The price index for gross domestic purchases was unchanged in 2009, compared with an increase of 3.2 percent in 2008. Current-dollar GDP decreased 1.3 percent, or $183.2 billion, in 2009. Current-dollar GDP increased 2.6 percent, or $363.8 billion, in 2008. During 2009 (that is, measured from the fourth quarter of 2008 to the fourth quarter 2009), real GDP increased 0.1 percent. Real GDP decreased 1.9 percent during 2008. The price index for gross domestic purchases increased 0.6 percent during 2009, compared with an increase of 1.9 percent during 2008. The above table breaking down the data by component is very interesting. You can see the 20.4% Q3 jump in durable goods from "Cash for Clunkers" then it dropped back to 0.2% in Q4. ExETFs—For the week ended 2/24/2010 All Equity funds report net inflows totaling $1.571 billion as Domestic Equity funds report net inflows of $0.840 billion and Non-Domestic Equity funds report net inflows of $0.731 billion... The rate of inflows to Non-Domestic funds stands at $1.492 billion/week, as measured over four weeks... ExETFs—Emerging Markets Equity funds report net inflows of $0.264 billion… Net inflows are reported for All Taxable Bond funds ($5.028 billion), bringing the rate of inflows of the $2.173-trillion sector to $7.573 billion/week... Net inflows are reported to Flexible Funds totaling $1.320 billion... Government Treasury funds report inflows of $0.803 billion… International & Global Debt funds have reported inflows (+$1.076 billion) for the forty-ninth consecutive week... Money Market funds report net outflows totaling -$1.509 billion... ExETFs—Municipal Bond funds report net inflows of $0.507 billion, bringing the rate of inflows to Municipal Bond funds to $1.087 billion/week. Weekly and monthly investor flows are aggregated in 19000 open-end mutual fund share classes with an $11 Trillion asset base that is sectored in datasets by investment objective as defined in the prospectus. A Tradeable Bottom at Hand? Many of my charts say the market may be in the process of making a tradeable bottom. In late 2009 and early (January) 2010 I took profits in my equity positions in both my personal and newsletter explore portfolios. Now I am back to buying as some of my stocks have fallen to their "repurchase levels." 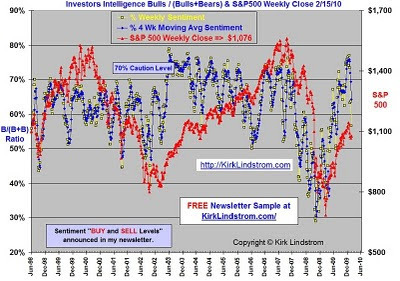 You can clearly see from my chart of the Investors Intelligence Bulls divided by (Bulls+Bears) ratio plotted with the S&P500 weekly close over time that the level was at near record levels between four and ten weeks ago when I was taking profits. Now it has fallen enough to start accumulating again, which I have. 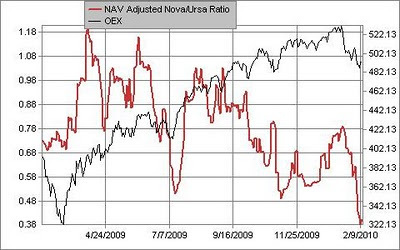 This chart courtesy of schaeffersresearch.com shows the Rydex Nova/Ursa Ratio. This is one of the charts I find useful for my contrarian analysis to find good times to buy and sell equities. The Rydex Nova/Ursa ratio is the ratio of the funds invested in Rydex bull funds divided by funds invested in Rydex bear (Ursa) funds. When investors who trade these funds are bearish, the ratio falls. As a contrarian, I like to do the opposite so I have been buying some stocks back for my newsletter explore portfolio that I took profits in recently at higher prices. I like to add to equities when most are bearish and the Rydex Nova/Ursa ratio falls. Likewise, I like to take profits when others are bullish and the ratio is high. The above charts and several others I follow are bullish and saying it is a good time to buy. I like to add to equities when most other investors are bearish. Likewise, I like to take profits when others are bullish. In addition, I am not market timing but for a small portion of my newsletter explore portfolio. I use market-timing indicators to tell me it is a good time to buy so I can add to positions when the market is down and thus help me overcome my fear to rebalance back to my target asset allocation. Likewise, when the market-timing indicators are saying to sell, they usually come when the markets are high where I want to be taking profits. The market timing indicators at market highs help me get over my greed and take profits. Now and then, I may make an asset allocation adjustment when the Fed Model and some other things I follow say the market is over or under valued. Some call that market timing, but I have stayed pretty close to 70:30 equities-fixed for many years despite the Fed model. My recent article titled "ECRI Global Inflation Outlook - Higher Inflation Ahead" showed that inflation pressures are building globally. In the United States, December CPI came in at 2.7%. Just last week, ECRI, the Economic Cycle Research Institute, said "With the USFIG now advancing for ten straight months, underlying inflation pressures are in a sustained cyclical upswing, promising higher inflation in the coming months." Even in Japan, the threat of persistent Japanese deflation "continues to recede." Series I Bonds (or iBonds) are a low-risk, liquid savings product. They are 100% backed by the US government and its ability to tax and print money. While you own them, they earn interest and protect you from inflation. Unlike Treasuries that pay interest at regular intervals, iBonds compound the interest similar to CDs. The rate you get for iBonds changes every six months based on the rate of inflation. You collect the interest and pay the taxes on the gains when you cash them in so they are a great way to defer taxable income. The earnings rate for Series I Savings Bonds is a combination of a fixed rate, which applies for the life of the bond, and the semiannual inflation rate. The 3.36% earnings rate for I bonds bought from November 2009 through April 2010 will apply for their first six months after issue. The earnings rate combines a 0.30% fixed rate of return with the 3.06% annualized rate of inflation as measured by the Consumer Price Index for all Urban Consumers (CPI-U). The fixed rate applies for the 30-year life of I bonds purchased during this six-month period. The CPI-U increased from 212.709 to 215.969 from March 2009 through September 2009, a six-month increase of 1.53%. If you redeem I Bonds before they’re five years old, you’ll forfeit the three most recent months’ interest; at or after 5-years, you won’t be penalized. You may purchase I Bonds at www.TreasuryDirect.gov and at most local financial institutions. Best Time to Sell I Bonds: At the start of the month since interest for the prior month is computed on the first of each month. You don't earn interest for fractional months so sell only after the new interest shows up in your account, usually the first of the month. Disclosure: I own TIPS, TIPS mutual funds and Series I-Bonds. I also own and cover them in my newsletters. See Kirk's Two Investment Letters for more information. Next: Come back later to read the next article in the series "Five Investments for Higher Inflation:Part 4: TIPS and TIPS Funds "
Disclosure: I sold all my bonds and bond funds not indexed to inflation. Besides cash in many CDs and savings accounts, I own TIPS, TIPS mutual funds and Series I-Bonds. I also own and cover these investments in my newsletters. See Kirk's Two Investment Letters for more information. Cash in savings accounts is one of the most conservative investment for rising rates. Cash is currently losing one to two percent a year to inflation as of the last reading, but until recently, cash was beating inflation. The idea with cash is you can usually get close to the current rate of inflation if you shop around. It is not perfect but it beats what could happen to bond funds should interest rates suddenly surge or bond investors sour on bonds. Bonds will probably lose NAV (net asset Value) when rates go up but cash in FDIC and NCUA insured savings accounts is always worth a dollar per dollar saved plus you get higher savings account rates as rates go up. I have critical mass (enough money to retire should I wish to stop working) so I am far more interested in preserving assets than taking risk with the fixed income side of my portfolio. I take plenty of risk with equities, especially in my "explore portfolio" where I have significantly out performed the indexes over the very long time. Of course, this great performance comes with considerable volatility so I want the fixed side of my portfolio solid to allow me to sleep well at night. That means I don't chase yield. Of course, with CPI-U inflation now at 2.7% and expected to go up, money in short term savings and US Treasuries is losing ground to inflation. I like savings accounts over US Treasuries because the rates are better so less is lost to inflation. If you don't need the money for a year, CDs are another way to lock in a rate if you are worried the rates on savings accounts will continue the trend to go lower and lower each month. Next: Read the next article in the series "Five Investments for Higher Inflation: Part 3: Series I-Bonds "
Gold is the traditional investment people use to hedge for high inflation. Gold is also a popular hedge for an "Armageddon Type" disaster but I prefer a portable water filter that I can use to make clean drinking water to trade for whatever I need. Obviously Gold was a much better investment ten years ago when it was 79% lower. Gold's price may have already anticipated future inflation. 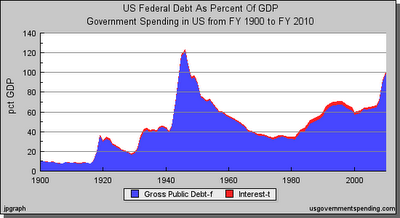 After all, the US and most other nations have been running budget deficits for a decade while gold has soared. Also, if you need more gold, you can hire people to dig it out of the ground for you. This could increase supply if wages remain low relative to inflation. Of course, if governments across the globe continue to spend like crazy and print money, then currencies could crash and gold would soar far higher. You can buy gold bars and store them yourself. Don't forget the cost of insurance, security systems and storage costs when calculating your return. You can buy gold coins and store them yourself. There is usually a large amount lost on the "bid ask spread." That means if you pay a dealer $1,000 to buy a gold coin, make sure to ask what he's willing to buy it back from you for. Before he knows you are considering buying, ask what he'll pay you for the coin you are interested in. You can buy gold mining stocks. With so many people willing to work for low wages around the globe, the cost of extracting gold from the ground might not go up nearly as fast as inflation. This would be good for gold mining stocks but maybe not for the metal itself. Of course, poor management or fraud could sink a gold mining stock even if gold soars so diversification is wise to spread specific stock risk. You can buy the ETF (exchange traded fund) for gold which has the symbol GLD (GLD Quotes and Charts). 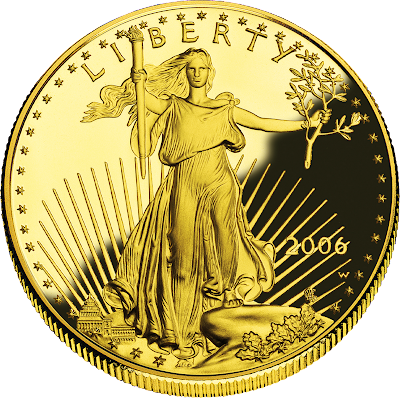 This would be my first choice as a way to buy gold other than the few small pieces I have hidden around the house worth a few hundred dollars for emergencies. Next: Read the next article in the series "Five Investments for Higher Inflation: Part 2: Cash"
The Economic Cycle Research Institute, ECRI - a New York-based independent forecasting group, in a series of six press releases last night and this morining, updated their outlook for global inflation. (More about ECRI). Below is a summary of ECRI's international Future Inflation Gauges (FIG) for February 5, 2010. ECRI’s U.S. Future Inflation Gauge (USFIG) continued to increase in January. The value of the USFIG lies in its ability to measure underlying inflationary pressures and thereby predict turning points in the U.S. inflation cycle. The USFIG rose to 102.0 (1992=100) in January from 99.0 in December, as did its smoothed annualized growth rate to 37.6% from 33.8%. The gauge was pushed up in January by inflationary moves in most of its components. in a sustained cyclical upswing, promising higher inflation in the coming months. Inflation in the Eurozone has begun to perk up, as anticipated by the upturn in the EZFIG. Clearly, with the EZFIG remaining close to November’s 11-month high, underlying inflationary pressures in the Eurozone have begun to resurface. German inflationary pressures dipped in December. German inflation remains in a cyclical upswing and well above its cycle low, in line with the upturn in the GFIG. With the GFIG staying near November’s nine-month high, German inflationary pressures are still in a cyclical uptrend. French inflation pressures rose in December. The FFIG has risen from the all-time low seen in June 2009 to its highest reading in over a year. Thus, French inflation is likely to rise further in the coming months. Italian inflation pressures eased in December. Italian inflation rose further from its mid-2009 low, as anticipated by the upturn in the IFIG. Meanwhile, despite its latest down tick, the IFIG remains near earlier highs. Thus, Italian inflation is likely to remain in an uptrend. Spanish inflationary pressures edged up in December. Despite its recent dip, the ESFIG remains in a cyclical upturn and well above its cycle low. Thus, Spanish inflation is likely to increase in the months ahead. ECRI’s Japanese Future Inflation Gauge (JFIG) advanced further in December. Japanese consumer prices have begun to stabilize following their deflationary decline. This was anticipated by the earlier upturn in the JFIG, which has now risen for five consecutive months to a 13-month high. Thus, the threat of persistent Japanese deflation continues to recede. Korean inflationary pressures increased marginally in December. With the KFIG rising to a 14-month high in its latest reading, Korean inflation will increase in the months ahead. ECRI’s Canadian Future Inflation Gauge (CFIG) edged down in December. Despite its latest dip, the CFIG remains well above March’s 26-year low, and close to October’s 15-month high. Thus, Canadian inflation pressures remain in a cyclical uptrend. U.K. inflation pressures were unchanged in December, according to ECRI’s United Kingdom Future Inflation Gauge (UKFIG). Despite its recent downtick, the UKFIG remains well above June’s all-time low and close to October’s one-year high. Thus, U.K. inflation pressures continue to be in a mild uptrend. Disclosure: I own TIPS, TIPS mutual funds and Series I-Bonds. I also own and cover them in my newsletters. The top rate for a certificate of deposit (CD) this week is at Pentagon Federal Credit Union (fondly known as PenFed CU) where you can get a 7-year certificate that currently pays 3.75% APY. For shorter terms, State Bank of India has a 1-year CD with a 1.76% annual percentage rate. The one year US Treasury rate is currently 0.30%. With rates so low, banks will try to sell you their annuity products. Make sure you read the article: Beware of Annuities. Amanita Forecasting's Bradley Turn Dates for 2010. 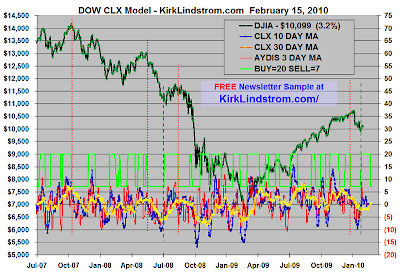 Amanita Forecasting uses the "Bradley Siderograph" and astrology to predict major market turns. It does not predict the direction.